This dish is another adaptation from various published sources. It is specifically aimed at those who sail about the oceans on longer voyages. And for those who would like to do so, but do not have the means to do so. Also for those who like uncomplicated food made in one pot. And especially for those who have had a their fill of stews, of various descriptions, and who would like to move on to a different dish for a change. 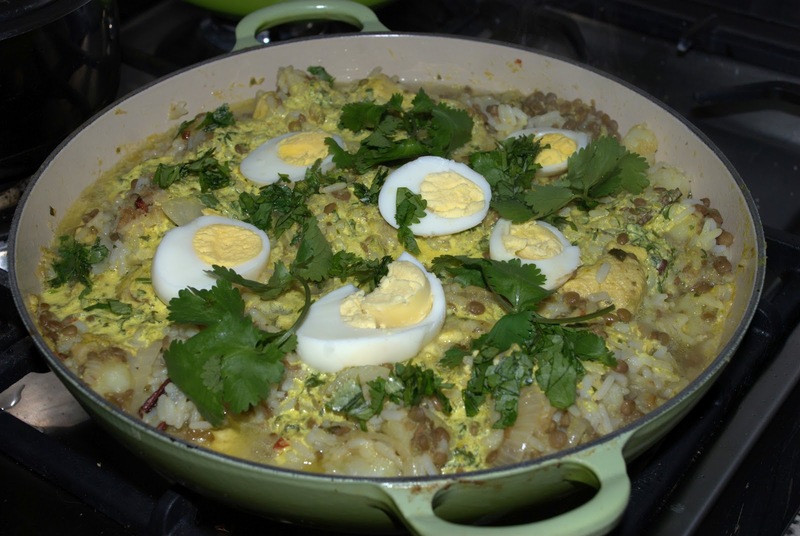 This dish is adapted from a fairly widely described Indian dish. Most of which requires the use of an oven. This one perhaps in a more Northern Indian style, with no oven required. It is easy to make and does not use a lot of cooking time. Cooking time, which relates to gas use, which of course is always in short supply on a long voyage. You need to have gas until the end of the trip, with maybe a little to spare, lest you eat raw rice soaked in sea water to make it edible. It is soul food, will settle your tum-tum in a storm and keep the crew happy. This recipe will make enough to feed up to six hungry sailors. This dish is meant to be made in one pot, for which I used a cast iron casserole for the main dish. You need a thick pot, otherwise the food may burn. The eggs were boiled along with the rice and lentil mix. 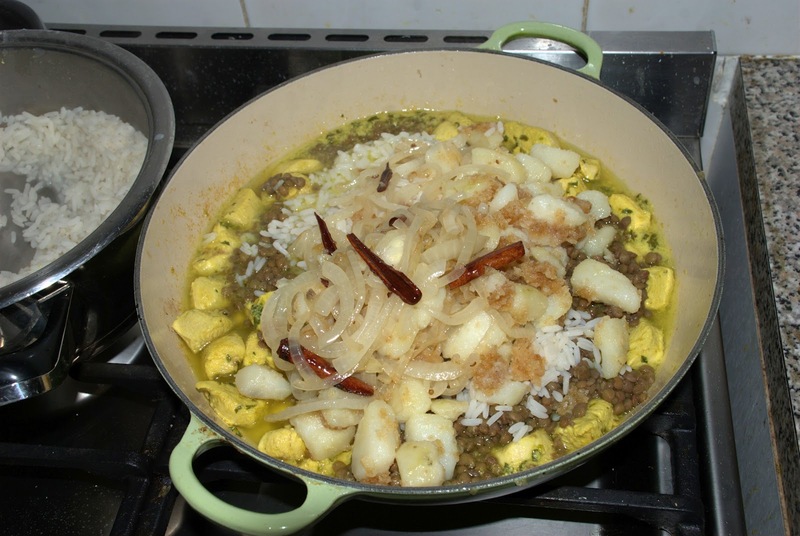 The potatoes were boiled first, then the rice and lentils were boiled in the same pot. Make sure that you have rinsed most of the starch out of the rice. 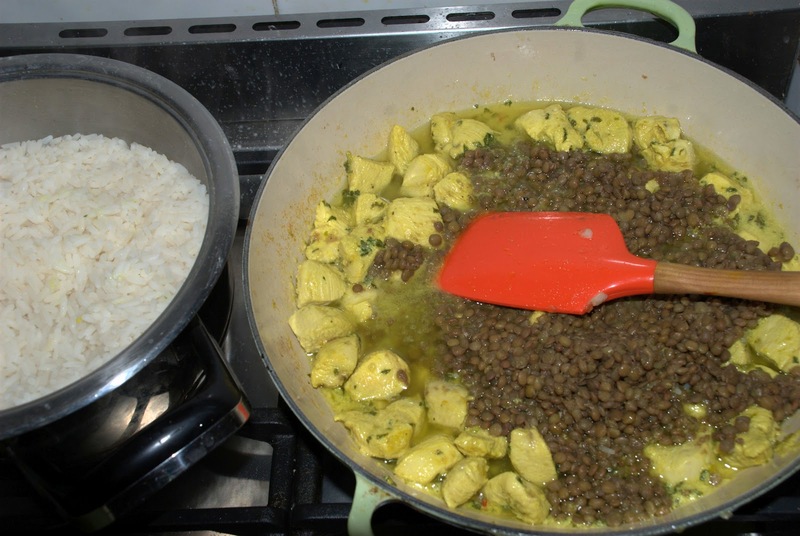 Failing that, you may need to boil the rice and the lentils separately, as per the normal recipe for this dish, which may complicate matters in a small galley. 1 cup sour milk, or normal milk soured with lemon juice, or plain, live yoghurt. I went the lemon juice way. 3 saffron stems and ¼ cup of boiling hot water, or a few drops of saffron essence. Otherwise use a dash of turmeric. Peel the potatoes and parboil them. Then cut them into small cubes and keep to one side. 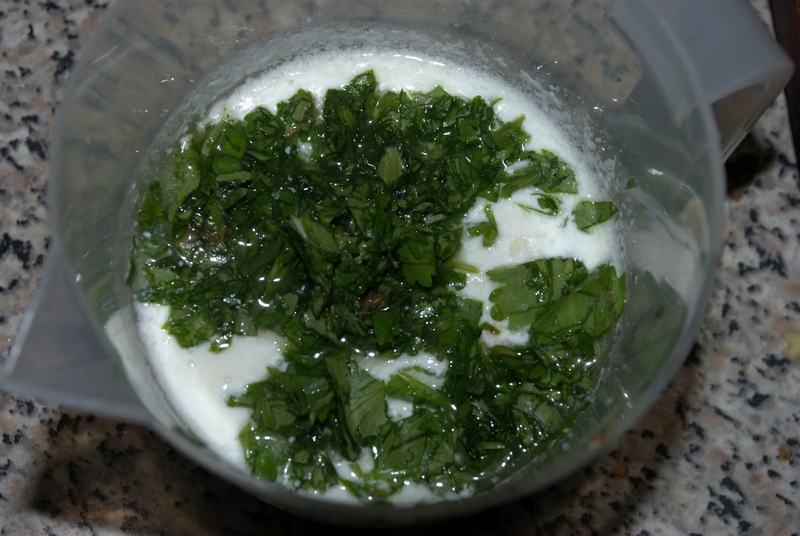 While the potatoes are boiling, prepare the marinade by adding the ¼ cup fresh chopped coriander to the sour milk or marinade base, whatever you are using. 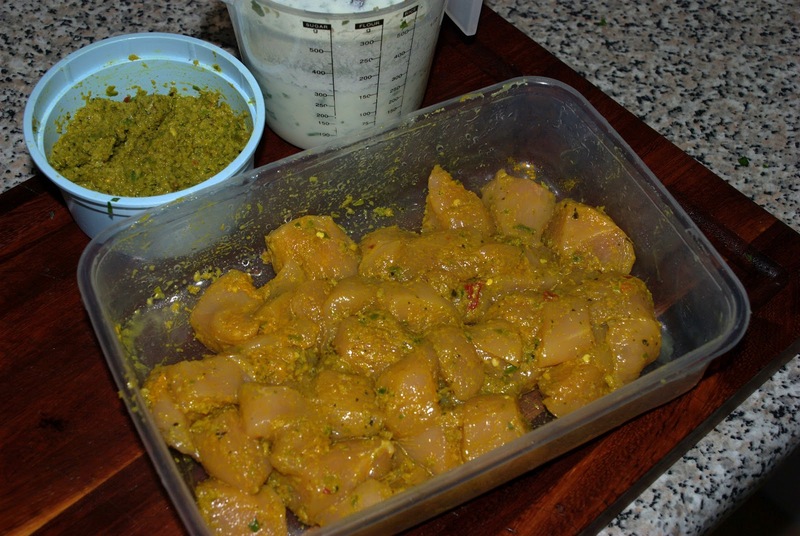 Chop the chicken into cubes and smear them with the green masala. 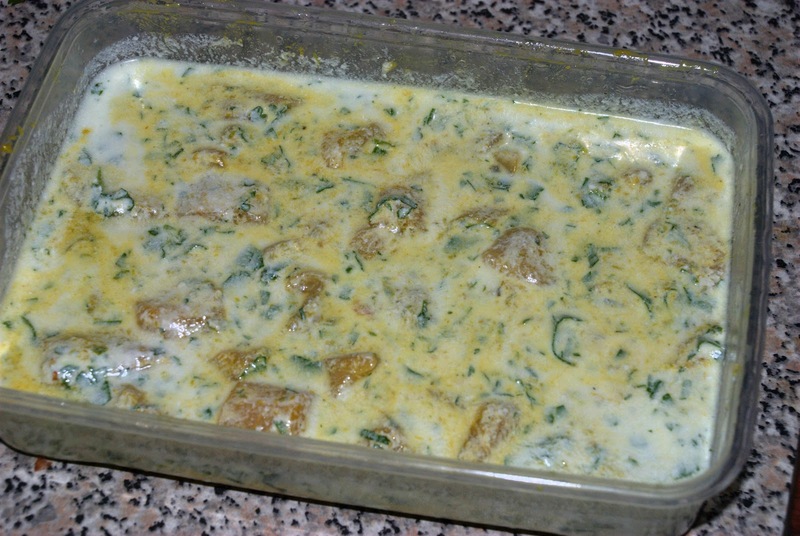 Add the sour milk and coriander mix to this and leave to stand for at least one hour. More if the chicken cubes are thicker than 12 mm (½ inch). In the mean time you may add the rice to the lentils and cook them until done. The normal biriyani recipe requires alternate layers of rice, potatoes, chicken and lentils, but we are doing this in one pot, so we may mix these two prior to final compilation. Remember to add some salt. 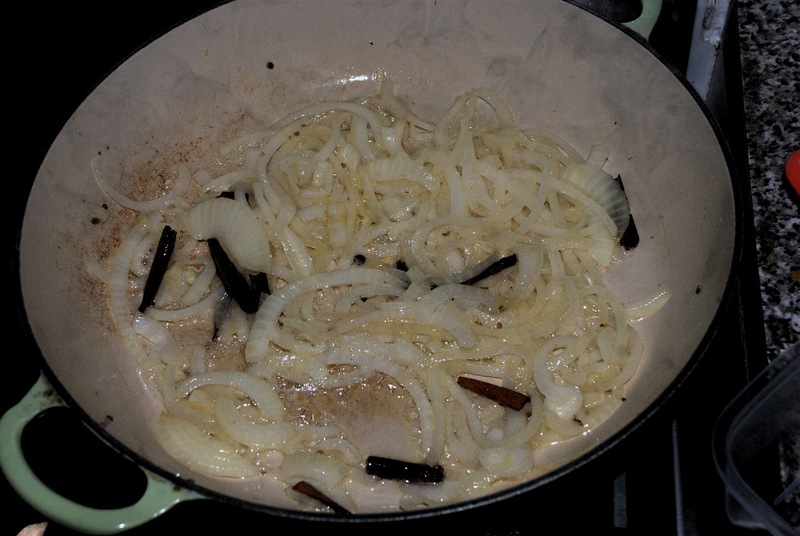 Start the main dish by frying the onion and chilli (finely chopped) in butter and some cooking oil, along with the cinnamon stick, cardamom and coriander seeds. I squashed the seeds in a mortar and pestle before adding them to the saucepan. Remove these when they are done and keep to one side. Now add the diced potato to the pan and fry them until golden brown. I rolled them in cake flour after dicing and before frying. I like to think that this adds to the flavour, but it is optional. Remove them from the saucepan when sufficiently browned, they are cooked after all. Add a little oil to the saucepan, which should be almost dry by now. Add the chicken pieces to the pan, keeping the excess marinade to one side. Fry/simmer the chicken until reasonably well done. The marinade will make the chicken quite juicy. Now add back the onions, potatoes, rice & lentil mix. Stir these for a homogeneous mix, then add the rest of the marinade to the dish. Also add the saffron at this stage, I used saffron essence, which I added to the leftover marinade and mixed it in before adding this to the dish. Simmer this at very low heat for another 20 minutes, then add the last of the freshly chopped coriander leaves and the sliced eggs as garnish. The last is the most difficult part. You need to switch off the heat and let the dish rest for ten to fifteen minutes, keeping the lid on. This is to let the flavour develop.